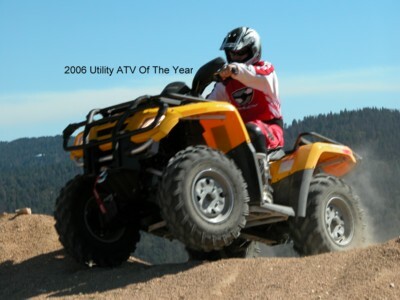 ATV: Outlander 800 H.O XT Wins Our 2006 Utility ATV Of The Year Award! 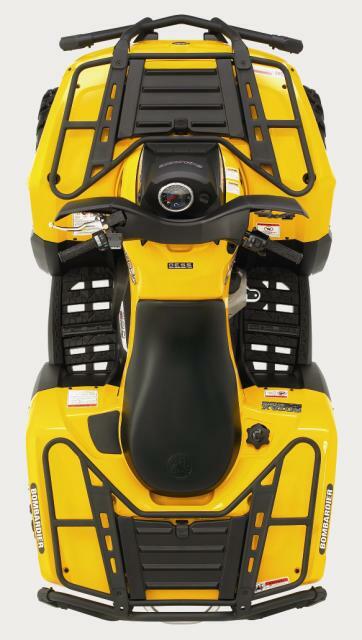 The Bombardier BRP Outlander 800 H.O. 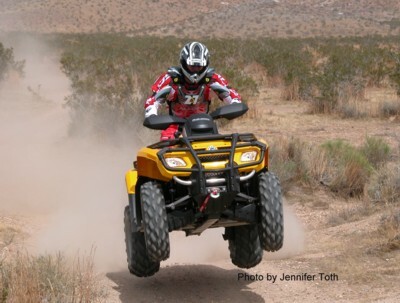 EFI XT wins “2006 Utility ATV Of The Year” honors. After riding this beast we have come to the conclusion that there needs to be another class titled “All Around ATV”, since this BRP Outlander does just about everything except race motocross. At first glance, the BRP Outlander XT looks like a mini Hummer. 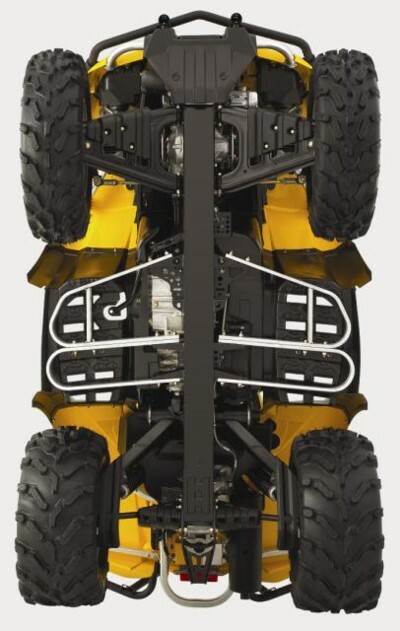 With its square lines, beefy racks and winch you can tell this is a serious off roader. 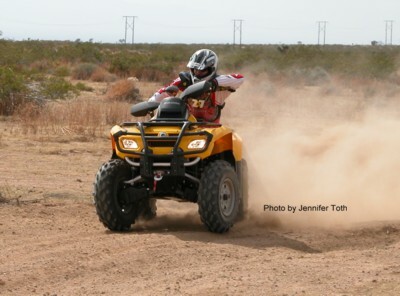 On our first test day with the ATV.Info riders, we had a few sport quads to go on our test trip with the Outlander 800. When riders started showing up and walked down the line of quads, you would hear a comment or two as they passed the Outlander, “looks like a Hummer”, “What a monster”. You get the picture. But all of the riders who hadn’t ridden this beast would walk on past and go over to one of the other sport quads, some of which where modified, and say I want to ride this one or that one. So, as we get ready to go on one of our test rides and every one picks a quad to ride, I end up on the Outlander as it was the only one left without a rider (remember this as you can’t judge a book by its cover). 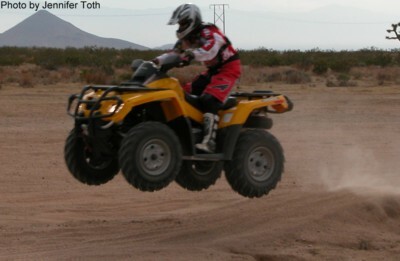 But, I have no complaints since I have already ridden this ATV and loved it. So we’re off, blasting through trails, climbing hills, and about 15 minutes into the ride we get our first “let’s switch, I want to try the Outlander”. So I say, “OK”, with a big smile, knowing Deny would dig this quad as he is the one out of the bunch who love’s climbing hills. We’re off again and after a couple of rutted out hills we take a pit stop and Deny pulls off his helmet, and with a big smile says, “ This Outlander climbs hills with ease”. Other riders started asking Deny questions: Does it go through the ruts good? Yes; does it feel top heavy? No; does it feel big? No; how was the power? Great; Etc. Etc. It starts to spur interest from the other riders and then everyone wants to ride it. I (Robert) personally liked how good it went through the trail whoops and jumps as the suspension soaked up the bumps. Although you won’t be hitting double jumps but you can have some fun. And, your riding time will increase about 2-fold since you don’t get as tired from riding this quad. 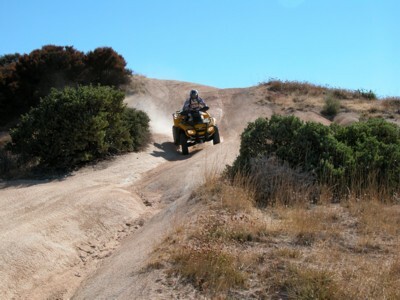 As rider after rider gets to have some riding time on the Outlander ATV, the results are the same. Nobody wants to get off it. 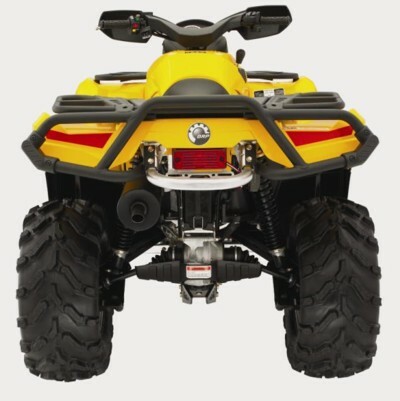 If you are looking to get an all around ATV, then this one hit’s the mark. Below we will show some other great features that made the Bombardier Outlander Utility ATV of the year. BRP set out to build not only a fun ride but one with muscle. They have developed this new 800cc, V-Twin four valve SOHC engine with fuel injection that delivers an incredible 62 HP!! “Which is the highest among all ATV’s to date for CC and HP”. The power is delivered to the ground by a Beefy CVT transmission with a high gear, park, reverse, and neutral gear selections. This has gotten rid of shifting gears and makes it an Automatic ATV. When you turn on the key and hit the start button, the Outlander fires right up (there’s no choke), and you hear a cool rumble from the exhausts. When you open it up on the trail, you can here a zippy wind “futuristic sound” from the transmission that makes this ATV stand out and turn heads. 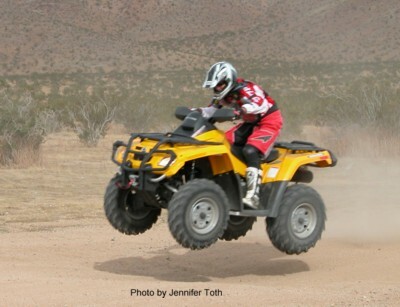 All of our staff that tested the Outlander where amazed at how hard this ATV pulled through the power band. 62 HP is plenty of power to do whatever you need as wheelies where no problem, hill climbs, ripping turns on the trails, or breaking the 26 inch tires loose and getting a little sideways. In fact, we don’t see any modification you would need to do to the power plant, not even a pipe. Gas mileage is always a plus these days and the Outlander 800 has a 5.3 gallon tank which will give you over a 100 miles. The outlander has independent rear suspension and uses trailing arms and makes for a stable ride with plenty of ground clearance (12 inches). 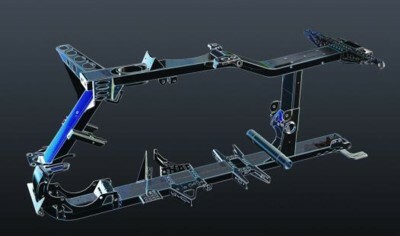 The front comes with dual a-arms with the top arms made out of alloy. 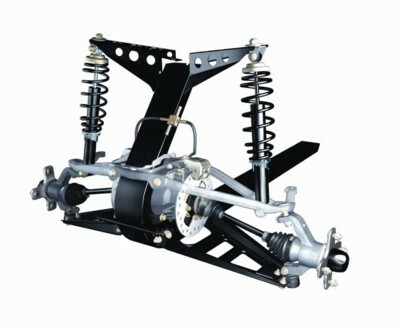 Shocks are preload adjustable and have 9 inches of travel in front and 8 inches in rear. This combo lets the 639 lb. 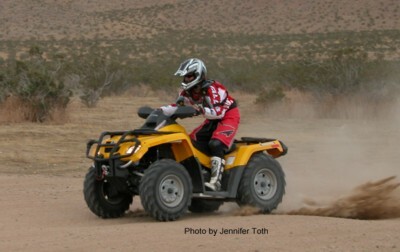 Outlander ATV tear up all the terrain in its path. On the front you have duel disk brakes mounted on both sides of the Visko Lok differential. And on the back there is a hydraulic disc mounted on the drive shaft which is unique. The Outlander has a single-spar rectangular frame which helps with sliding over rocks and logs. The BRP Outlander XT comes with a 2500 lbs. Warn winch with a tow capacity of 1300lbs. The Bombardier XT has a Hummer like look and comes with hand guards and heavy duty bumpers. You have front and rear storage compartments protected by steel storage racks that hold 100 lbs. in the front and 200 lbs. in the rear. Also, the Outlander has nice gripping pegs with enclosed running boards. The Max version comes with a 2 seat version. Comes with a state of the art gauge system that is easy to read and is programmable. You can program it to talk to you. You can actually read the MPH when riding. Also, you can choose to view rpm or speed. Photos by Jennifer Toth and John Camacho.